You never know who you’ll meet in a bar in Kathmandu. Sitting in a small hotel with my old friend Karna Sakya, I wondered aloud what I was going to do for the next few weeks before meeting a Swiss friend in the high, remote Rowaling valley west of Mt. Everest. We were planning to cross the 19,300’ Teshi Lapcha Pass from Rowaling to the Khumbu in late November but this was only mid-October. Karna, long active in wildlife affairs in Nepal, told me a friend would be joining us for dinner. His friend was working on the Smithsonian/World Wildlife Fund Tiger Ecology Project in the jungles of southern Nepal. In walked David Smith. Throughout the evening David talked of his work in the Nepalese jungle. He was studying the dispersal patterns of the tiger by means of radio telemetry. The great cats were tranquilized, fitted with transmitter collars, and their movements tracked by plane, elephant, land rover, and on foot. The project was to determine if the tiger had enough protected land to assure a viable population in its natural habitat. At the end of the evening, Dave confided that he was behind in his work and needed help. Lights went on and embers began to glow in the recesses of my mind. The next afternoon I climbed off the small Royal Nepal Airlines Twin Otter as it skidded to a halt on the grass airstrip at Bharatpur in the vast expanse of land known as the Terai. The Terai encompasses the entire southern border area of Nepal that meets the northern border of India. A rich assortment of wildlife is found here, and at one time was home to one of the healthiest populations of malarial mosquitoes. One major reason why Nepal was never colonized by any foreign power. With the advent of chemical pesticides and international health efforts, malaria was, for a time, completely eradicated in Nepal. This was good the people but bad for wildlife. As the rich, flat land of the Terai became hospitable for humans, people flocked down out of the steep, unproductive hill country and vast areas of jungle and forests were destroyed. This migration seriously disturbed the natural habitat of numerous exotic birds, sloth bear, crocodile, rare gharial, gaur, leopard, the one-horned Indian rhinoceros, and, of course, the tiger and its predominant prey species, the chital (spotted deer), hog deer, barking deer, and the majestic sambar. The farsighted creation of the Royal Chitwan National Park in 1973 stemmed the tide of habitat destruction and there now exists an abundance of wildlife although by no means free of threats to their existence. I arrived at the campsite at Saurah after dark to much excitement. A leopard had been seen in the area and I had just crossed several hundred yards of thick brush blissfully ignorant of any danger. Dave greeted me at camp and informed me that we were to take off before dawn the next morning. We were to be in pursuit of a tiger whose pug marks (footprints) had been seen nearby and the bait had already been set. 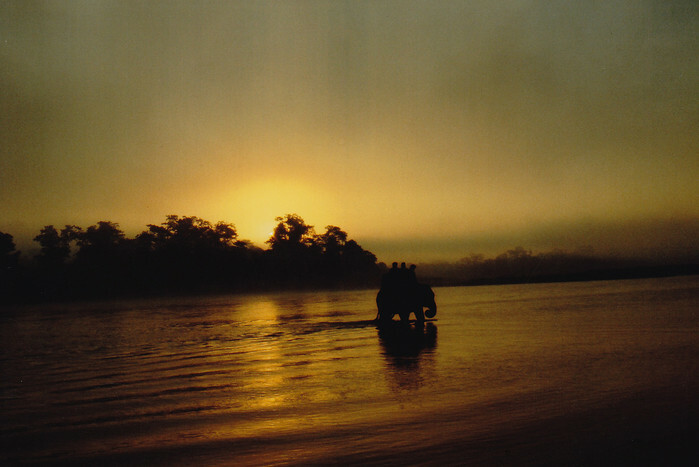 At 5 am, atop our elephants, we crossed the Rapti River before entering the deep sal forest and 25 ft. high jungle grass. Unlike tiger hunts of old, we rode, not as Kings and Maharajas seated atop stately palanquins, but as a ragtag group of ten clinging to crude burlap pads. Our only support were the loose ropes hanging from our three elephants. Nor were we destined for a comfortable tree house (machan), armed to the teeth while hundreds of wild eyed servants pushed a tiger to its untimely demise. We would be only two, climbing up a tree of our choice, and armed only with one small shotgun carrying a dart filled with the powerful tranquilizer known as phencyclidine. I had never gone to work on an elephant before and was a little nervous as we lumbered down the steep, sandy riverbank, sliding into the fast moving post-monsoon water which at time reached the chest of the elephants. I marveled at the control the barefooted elephant driver had over this massive beast by mere toe pressure near the skull behind the ears. Left, right, forward, backward, all dictated by toe signals and occasionally confirmed by a whack on the head by a hard stick. The river was crossed and the hunt was on! The poor water buffalo didn’t have a chance. It had been tied to a post, as bait, just off the dirt road about one hour from camp. The elephants kneeled down for our dismount and it was apparent the tiger had come. What remained of the buffalo was covered with flies and there was the unmistakable smell of death in the air. Dave and his associate, Prem Bahadur Rai, discussed the strategy for catching the tiger by whispering and animated arm motions. This strategic pantomime was not intended to keep tiger from coming after us, but to prevent it from hearing us and leaving the area. By all means, I thought nervously to myself, let’s keep the tiger real close. The tiger is a smart and solitary animal which will avoid contact with humans under most circumstances. Indeed, on subsequent forays into the jungle, I came to worry more about wild boar, sloth bears, cobras, pythons, and the dangerously unpredictable rhino. Such was not the case this day, and I found myself backing in towards the gray wall of the elephants as if their bulk would protect me should a tiger suddenly appear. The grass is so high and dense in the Fall that the light of day barely hits the pathways tunneled out by the animals who live here. Once it had been established which direction the tiger had taken its meal it became guesswork as to where the tiger was. The optimum situation is that the tiger drags its meal 50 to 100 yards into the dense brush and remains, either eating or sleeping after a good meal. We climbed back atop the elephants and, as quietly as possible, ventured forth in a wide arc to a point about 500 yds. past the kill. Dave selected a tree which would give him the best view should the tiger come our way. I was designated a tree some 30 yds. behind him and told to see where the tiger goes should the darting process be successful. Standing on the elephant I clumsily climbed up into the tree and made myself as comfortable as possible as the elephant disappeared into the forest. This darting process is imprecise and fraught with potential error. The responsible approach dictates a clear and unhurried shot. If the tiger is not shot in the thick muscle of the neck, should, or hind quarters, death may occur. By studying the pug marks (footprints) one can get a good idea as to the size and weight of the animal to gauge the amount of drug to be administered. Too great a dose and the animal may die. Too little and it may wander off where it cannot be found. It could then be vulnerable to other animals or to drowning in the water it is normally fond of. Once safely in our respective perches, the tiger trackers, known from the old days as shikaris, fanned out in a wide V direction stringing loose cotton cloth from bush to bush. This cloth forms a very crude funnel in which to guide the tiger to us. It is hoped that the tiger, once disturbed by the noise that would soon follow, in leaving the area pass close enough under the right tree so that a clear shot could be taken. As I learned several days later, a cornered tiger will leave in any manner it chooses. What happen next is controlled chaos. The shikaris have strung the ‘beat cloth’ and remounted the elephants out near the kill, or bait site. At a given signal, the begin ‘pushing the beat’ towards us. The elephants, sensing the presence of a tiger, trumpet nervously while crashing down any bush or small tree that gets in their way. The point now is to make as much noise as possible. This bizarre jungle symphony did not resonate long before I saw Dave stand up quickly and point his gun downward. From my vantage point I heard only a loud “POP”, then a muffled roar, a flurry of movement and wild thrashing off to my left deep down in the grass- then silence. The tiger had fallen. I climbed out of the tree onto a waiting elephant and we hurried to where the grass had gone still. One of Dave’s assistants yelled that the tiger was there. Almost falling off my elephant I had to fight a combination of panic and excitement as I walked through the dark grass to the nearby voices. There lying before me was a magnificent female tiger. It took me a few minutes to trust the fact that this animal was really tranquilized and I approached cautiously. She measured 8’6” from head to tail and weighted 350-400 pounds. Her breathing was heavy and uneven and her eyes were wide open, staring as if bewildered. Her fur was short. Tough and bristle like to the direct touch but like the finest Chinese carpet when stroked gently. Her whiskers were long and taut like violin strings. As a precaution to an adverse reaction to the drug, I continually monitored the tiger’s temperature and cooled her down with buckets of water from a nearby stream. Dave secured around the tiger’s massive neck a collar with a small transmitter powered by a lithium battery and set to a frequency on one our portable receivers. After several hours the work was done and the tiger slept soundly. We retreated a safe distance as evening approached and waited to assure that nothing went wrong during the tiger’s awakening transition back to a normal life. As I sat there, on top of an elephant, reflecting on what I had just had the rare privilege of experiencing, the great beast awoke, took a few stumbling steps, then slowly blended into the darkness. Idly looking down, I noticed a small orange spot in the grass. Out stepped a baby tiger cub no more than two feet long. Then a rustle in the grass and another cub emerged. And another! I couldn’t believe my eyes. The cubs lapped up the cool stream water oblivious to me. I did nothing to disturb that oblivion! Foremost in my mind was a story I had heard at camp the night before about a Nepalese researcher, Kirti Man Tamang who had been pulled from a tree by an angry tigress protecting her cubs. Tigers can’t climb trees, but, strengthened by anger, can get up pretty far. One can only imagine what was going through the mind of this poor chap when the tiger, unable to reach him by standing and roaring, retreated 50 yards to get a running start. One great leap and reach and the man was pulled out of the tree, flesh on one leg ripped to the bone, and knocked unconscious as he fell to the ground with the tiger. Content only to protect her young the tiger left the man alive. Kirti Man had been about 18 ft. up in his tree and until then had been the accepted margin of safety. I surveyed my perch and decided to suspend all breathing. 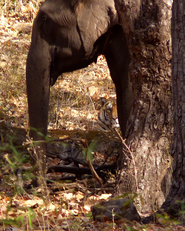 The elephants were getting closer and their increasingly frantic trumpeting betrayed the presence of a tiger. Watching the little cubs move off into the dark grass opposite the stream, I barely had time for a sigh when my reverie was shattered by a primordial roar nearly flinging me out of the tree. To this day I cannot adequately describe the power of that sound but the expression ‘blood running cold’ surely must have its origin in an experience like this. Frozen, I watched the grass move violently off to my right. A large tigress crashed through the beat cloth, exploded through the thick grass, ran across the stream directly beneath me, and disappeared into the darkness behind her cubs. It was over. My heart was still pounding as the elephants crashed up towards my tree while the men chattered nervously as to the whereabouts of the tiger. She had escaped with her cubs. I had no regrets. On this day and others, I had been blessed to see, hear, feel, and experience, far more intimately than anyone had a right to expect, life with one of earth’s most magnificent animals. An abiding sense of good fortune has been forever etched within me.